Through the years I have been an avid user of their Daily Moisturizing Lotion (I even talk about it in this post), it's filled with oatmeal and emollients that really help desperately dry and itchy skin. If you suffer from any skin issues I highly recommend this, it's my favorite in the wintertime because it helps with the severe dry skin I deal with. Aveeno's claim is this lotion helps dry skin in one day and makes skin healthier within two weeks, which is definitely true, I feel like the skin on my body actually gets a glow to it when I use this. It will moisturize your skin for a full twenty-four hours and my favorite time to put it on is right out of the shower; I do have to say though if I'm having a particularly bad dry spell I will use it twice a day and that helps to sooth it. One of my favorite parts is that it is fragrance free, which means that it doesn't compete with whatever fragrance I want to wear. Recently Aveeno came out with this in a Sheer Hydration formula that absorbs quickly and has a powder-like finish that I haven't tried but really want to check out. Last summer I accidently picked up Aveeno's Skin Relief Shower & Bath Oil because I thought it was body wash. I've been using it ever since and actually like it much better than a traditional foaming body wash. It's super lightweight and also contains skin calming oatmeal. I'm not a big bath person so at the end of my shower I apply it to my arms and legs and rinse it off, I then pat my skin dry and put on lotion (beauty tip: pair it with the Daily Moisturizing Lotion to seriously soothe dry skin!). For my face I have been loyal to Aveeno Smart Essentials Daily Nourishing Moisturizer Broad Spectrum SPF 30 for quite some time, one of my first blog posts was actually a review of it you can find here. This is oil free, noncomedogenic, and hypoallergenic, it will not clog your pores or irritate you skin, which I can attest to. It it is packed with antioxidants, Vitamins A, C, & E, that work to fight free radicals your skin comes into contact with and helps to combat aging. I also really like that it has SPF 30 because most face moisturizers only have SPF 15 and I know it has saved me from getting sunburn. For night I like both Positively Ageless Reconditioning Night Cream and Smart Essentials Nighttime Moisture Infusion. Positively Ageless Reconditioning Night Cream is very light weight, yet still moisturizes well. It's designed to work while you sleep and uses a Natural Shiitake Formula to renew skin and reduce signs of aging. Smart Essentials Nighttime Moisture Infusion is from the same line as the day lotion and it is a bit thicker than the Positively Ageless moisturizer. Like the day lotion this too uses vitamins and antioxidants to neutralize any free radicals on your skin. This works to restore the skin's moisture barrier during the night and I always feel like I wake up with radiant skin. If you're someone who likes to use different face creams depending on the season I would say to definitely use the Positively Ageless moisturizer in the summer and Smart Essentials moisturizer in the wintertime. While I do love both, the Smart Essentials moisturizer is my current favorite. I love each of these products and use them religiously. 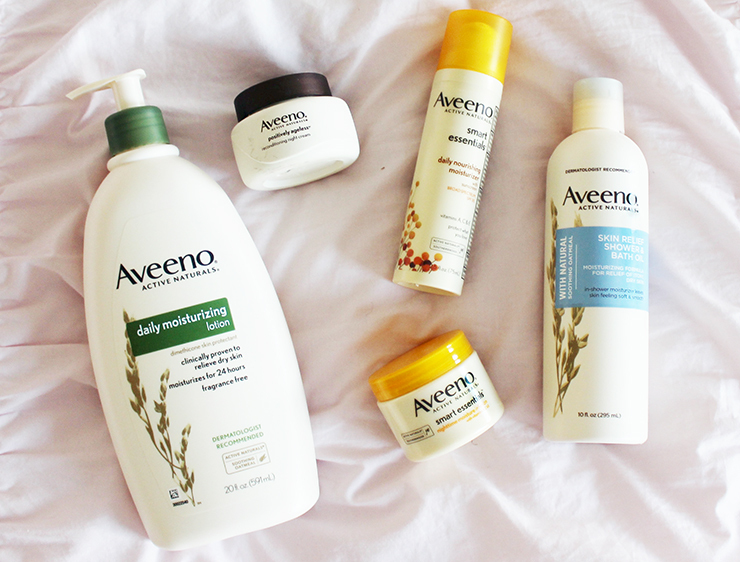 Aveeno has such a great selection and their items make skincare seem fun and luxurious, which is great at a drugstore price. Today I'm linking up with Thursday Fashion Files, Summer Style Weekly, and Throwback Thursday. I LOVE Aveeno!! They make the best products. I use them all the time because I have super sensitive skin! They make the best moisturizer! 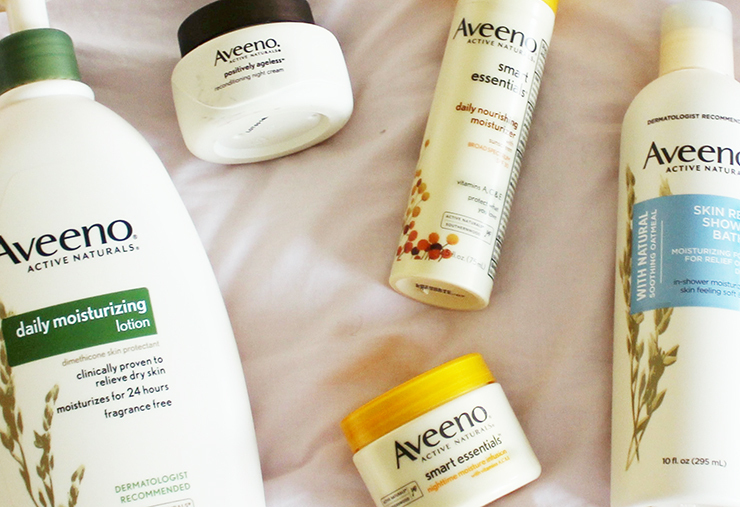 Aveeno does make a great moisturizer. Accessible now at Organic Skin Care, nourishment and mass retailers crosswise over Australia.